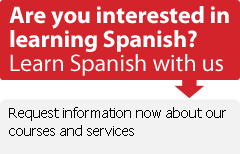 « Next Article: Why would don Quijote give away 20 Spanish courses? En su sentido primigenio, esta palabra designa el lecho natural de las aguas de lluvia, cuando caen en forma abundante. En la Argentina y el Uruguay, se usa para designar las avenidas que bordean la costa del Río de la Plata o del océano Atlántico, mientras que en Cataluña y Valencia se usa para denominar avenidas amplias y arborizadas, que en otros lugares se llaman bulevar. Rambla proviene del árabe hispánico ramla y éste del árabe clásico ramlah, que en esa lengua significa "arenal". As much as it delights me daily, El Castellano's palabra del día is aimed at native speakers and likely not a good bet for beginners. If you've yet to discover don Quijote's palabra del día, it's published daily on the website, or you can link to the week's words from the Weekly Lesson free e-mail lesson sent out to don Quijote web members. don Quijote's Spanish word of the day is definitely designed for students of the language, and includes an audio file so you can hear the word spoken, a definition in English, and a literary excert in which the word is used. We've been learning animal words lately in don Quijote's palabra del día. Today's word is lombriz. Can't say I knew that when I got up this morning. Hi, not sure how does this work as it is my first time in spanish-teaching. I'm a spanish teacher living in Essex and I'm also colaborating with puntoycoma magazine. I thought you may be interested in taking a look at the magazine in http://www.pyc-revista.com/. You can contact me at rebjulio@tiscali.co.uk. The requested URL "https://www.donquijote.org/system/gen/blogs/blog10.asp" was not found on this server. Receive don Quijote's monthly newsletter! © Spanish Teaching Blog 2005 - 2019 don Quijote S.L. All rights reserved.